One thing we appreciated with higher-end places like Chef Tony is the cleanliness and refreshingly “ok” service. Growing up, friends and family would buy boxes of mooncakes for my parents, so they were like a regular yearly treat. I slowly realized two things: mooncakes cost a lot, and they are VERY calorific (almost 800 calories for one mooncake that has one egg yolk in it). Here’s Chef Tony’s current menu. Majority of the dim sum items are $5.98 (marked with an “L” for large). Desserty part of the menu. Ah, the infamous $22.80 plate of stir fried flat rice noodles with matsutake mushrooms and beef shoulder tender. Shrimp and Matsutake Dumplings ($5.98). These were a great high start to the meal. Things sorta sloped downwards from this point on, but I think it was partly the food and partly my mood and “something is wrong” feeling in my gut that day. Anyways, these har gow were a surprisingly petite and delicate mouthful, with fresh-tasting shrimp and earthy mushroom background. 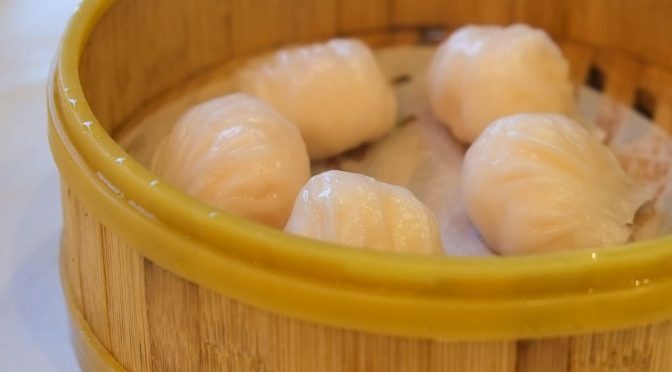 They remind me of how har gow were like in the 80s before 90s cultural excess made them ridiculously big and impossible to eat in one bite. I didn’t notice any matsutake inside, but could taste it and liked how it melded with the shrimp flavour. Shrimp and Yellow Chives Rice Noodle ($5.98). Light, slick, and slippery. I was really surprised by this attractively-named Flaky Almond Meat Loaf Sticks ($5.98). The crispy outer almond layer actually tasted great with the moist meat mixture inside. We think it was pork. After the har gow, this was my favourite bite of food. After this point, things got a little unexciting for me. Chinese Donut Stuffed with Shrimp Paste ($9.98). In a case of “you snooze, you lose”, I actually didn’t get to try this dish, although Wicca did and enjoyed it. I’m sure I would’ve liked it too. But dim sum has always been a love/hate thing for me, someone who likes to take their damn time eating and enjoying. Dim sum is a battlefield of which I am born to observe but perhaps not fight in. Marinated Free Range Chicken in Huadiao wine ($8.98). Also known as drunken chicken, this dish is served cold, like regular Chinese poached chicken (aka white cut chicken). I’m sort of familiar with this dish, but it was never a popular dish in my family. It’s in that “take it or leave it” category for me. I did appreciate that they use free range chicken though, and enjoyed the tight yellow skin and tasty fat. Honey Flavoured Brown Sugar Cake ($5.18). Nice texture that wasn’t as rubbery as I’ve had at other places, but the flavours could’ve been more caramelized and intense though. Portion size a bit chintzy. Pan Fried Chives Rice Crepe ($7.98). The rice crepe was very mochi-like…soft and chewy. Along with chives, there were bits of ground pork and dried shrimp inside. This wasn’t loved by everyone at the table. I was just ok about it. Wicca hated the chives but liked the crepe part. Marinated Chicken Trimmed with Black Truffle Flakes ($28.80 for half a chicken). Chef Tony has a couple dishes that are “trimmed” with stuff, and I have no idea what “trimmed” means in this context. This dish was ordered but not entered into their system, so by the time we noticed and asked for it to be re-ordered, it came out very late and looked rushed. I noticed black truffles being used in dim sum a couple years ago. I thought that there ain’t no way these restaurants are using good quality European truffles. They’re using cheap Chinese truffles goosed with truffle oil, and using the cachet of truffles to fancify something which people are then falling for. It’s like gold paint on a wooden carving, cuz like actual gold would be expensive, right? And you can have all the surface glory at a tenth of the price using gold paint. As for the actual taste of the dish, it was very similar to the drunken chicken…served cold but minus the wine but add truffle sweepings, which really didn’t do much for the chicken. The flavour did not justify the cost. Can you spot the hair? Chills your spine, doesn’t it? I was hoping it was just an arm hair. I’d even settle for an armpit hair. Crispy Dried Shrimp and Preserved Meat Sticky Rice Roll ($5.98). Slightly greasy but otherwise good. It’s sticky rice with bits of preserved pork and dried shrimp, wrapped in some sort of coating and deep fried until crispy. But as good as it is, just not my kind of dish, and I don’t see myself ordering this for myself. Their famous Steamed Sweet Salty Egg Yolk Lava Bun ($5.98). While previous versions of this popular dessert I’ve had were sweet ‘n custardy, this one skewed more salty. It had this balance of actual salted duck egg yolk and sweetness, making for an interesting sweet/salty thing. If you like that sweet/savoury thing in desserts, this is the “original”. Baked Almond Creamy Paste Buns ($5.98). Wicca ordered this on a lark. Turned out to be just ok. The bun part and the cookie topping part were light and delicate, but the filling tasted too much of thickener or cornstarch. Some genuinely good bites of food, but also some not-so-good. I admire the accolades this place gets (actually, I don’t). I’m in no rush to go back. And strangely, the mushroom pastry was my favourite, seeing as I’m not usually a big ‘shroom fan. I thought both the pastry and filling were really well executed. I also really enjoyed the old-school-small-size of the har gau and the subtle pine mushroom flavour, plus the almond tube of deliciousness.Agree the noodles were a bit of a letdown, but then again I don’t care for crab, and it went against my rule of not ordering outside the dimsum menu during dim sum. I would return to try other options, given there are so many, and because the service was quite good in the calmer side room.